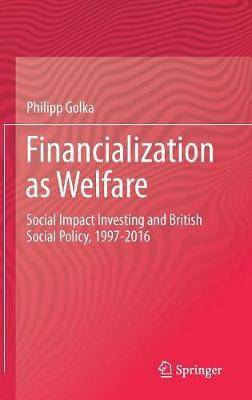 Providing an in-depth case study on the emergence of social impact investing in the UK, this book develops a new perspective on financialization processes that highlights the roles of non-financial actors. In contrast to the common view that impact investing gears finance toward the solution of social problems, the author analyzes how these investments create new problems and inequalities. To explain how social impact investing became popular in British social policy despite its unclear effectiveness, the author focuses on cooperative relations between institutional entrepreneurs from finance and various non-financial actors. Drawing on field theory, he shows how seemingly unrelated social transformations - such as HM Treasury's expanding role in public service reform - may act as resonance spaces for the spread of finance. Opening up a new perspective on financialization processes in the terrain of public policy, this book invites readers to refocus scholarship on capitalist dynamics to the meso-level. Based on this analysis, the author also proposes ways to transform social impact investing to increase its potential for reducing global inequalities.